Your contribution to AFKMC today improves the quality of life of Kaplan Medical Center's patients, speeds progress of our medical care, and brings relief to the community of one million Israelis in the heartland of the Jewish State! On their behalf, we thank you for your generosity. For room dedication and other naming opportunities, please see details here. If you're considering legacy or planned giving, we have information here. All donations are tax deductible but please consult your accountant or attorney for details. Please fill out the donation form. 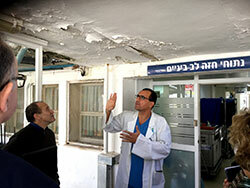 Current Cardiac Center - located in barracks from 1953, with the ceiling falling down!